사용자의 편의성을 고려한 UI 를 제공해온 네이버가 워크플로우, 인사, 회계, 비용 시스템에 LINE WORKS 그룹웨어를 결합하여 사원간 원활하고 효과적인 커뮤니케이션을 도와드립니다. 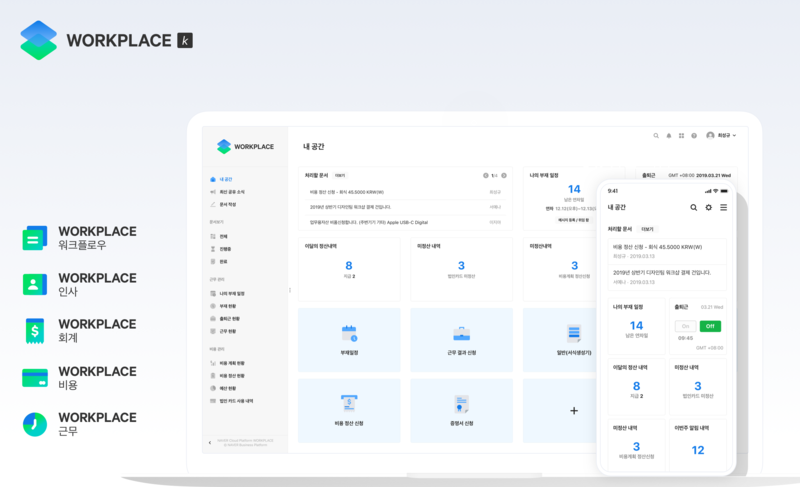 Built with Naver's long experience of creating an easy-to-use service, users and administrators can enjoy great convenience with user-centered processes and UI. You can share attendance through workflow and effortlessly create a statement for an expense settlement. All functions of the PC web service are available through mobile app, so you can conduct your work effectively without the limitations of time or space. Our services contain the business know-how of Naver gained from global collaborations. WORKPLACE helps you make payments easily by automatically importing the corporate card transactions of major credit card companies in Korea. It also helps to naturally accomplish transparent expense management by sharing the expense handling process with internal and external participants. You can allocate the annual budget for strategic management and set audit rules to self-check before making an expense report and ultimately reduce the expense handling time. Leave the small expense-related work to WORKPLACE, so the administrator can focus on making the expense-related decisions. 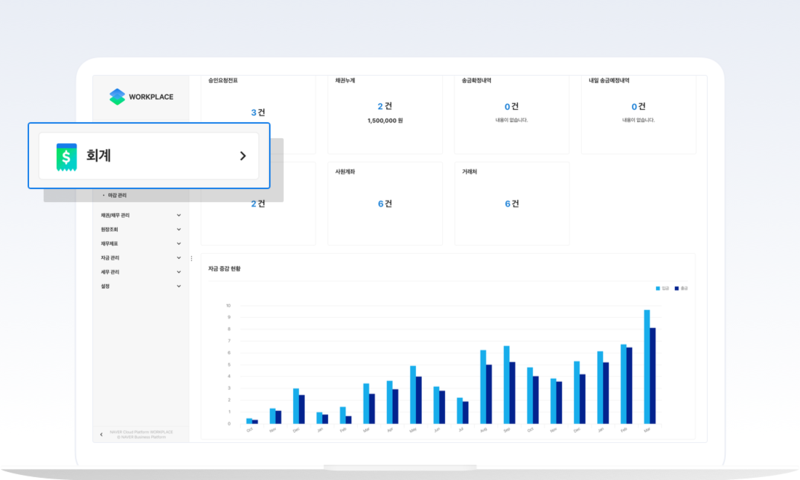 The HR and accounting management features follow the standards of the Constitution of the Republic of Korea and the Korean Generally Accepted Accounting Principles. So, it reflects the new regulations on the system for you so you have one less thing to worry about. The criteria for calculating annual leave and tax information for reporting, such as withholding tax/VAT, are based on the Korean standard. 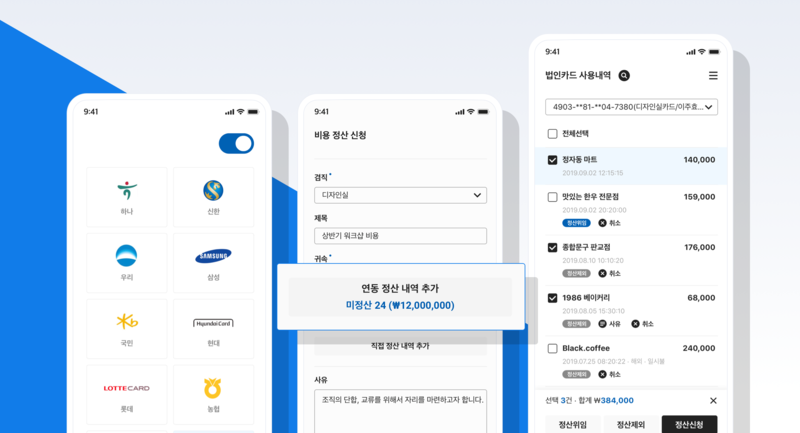 Also, the default items have been set to those widely used in Korea, such as personal leave and business trips, so companies can easily add compensation information. 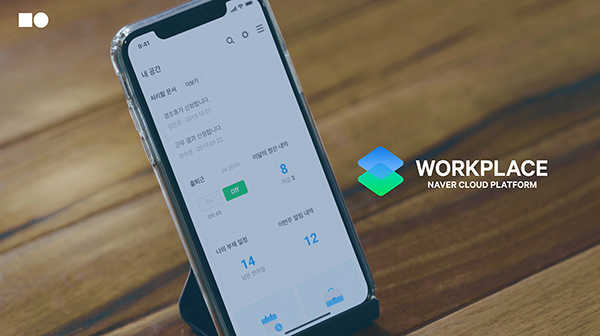 You can use the WORKPLACE by combining with LINE WORKS, a provider of NAVER Mail, Calendar, and Drive services for enterprises. It supports convenient use by linking to organizational and HR information and fast handling of business processes via email consent and messenger consent (scheduled services). Try using groupware and the enterprise information system used by NAVER and LINE employees at a reasonable cost. I'm worried about introducing a complicated enterprise information system package. I am starting a business, but want a simple, yet efficient management process. I am not comfortable with the enormous system establishment and operating costs. 업무상 사용된 비용을 투명하고 효과적으로 관리할 수 있습니다. 법인카드 거래 내역을 스크래핑하여 빠르고 편리하게 비용 처리를 할 수 있으며, 워크플로우로 완료된 내역은 회계 관리에서 자동으로 전표가 생성됩니다. 회사 및 사원별 계좌로 비용 정산 금액이 입금되어 돈의 흐름을 클릭 몇 번으로 관리할 수 있습니다. 비용 정산 신청 과정에서 설정된 예산 한도 내에서 결제방법(법인카드/개인카드/현금) 이나 휴일 사용, 총 금액을 check 하여 등록자가 미처 인지하지 못한 비용 규정을 확인해 줍니다. 특히 외부인이 포함된 경우 1인당 금액 한도를 설정할 수 있어 부정청탁 및 금품 수수 금지 법률에 대응할 수 있습니다. An organizational chart, member management, rank/job position management, and job appointment features are provided. A flexible setting for annual leave calculation criteria, congratulation and condolence funds, and business trip allowances is possible to allow HR management according to company regulations. Absence management is easy using the absence schedule and is also linked with annual leaves, including calculation of wages. If combined with LINE WORKS, internal communication within the company becomes faster via email and messengers that use contacts linked to the organization chart. We provide a web-based accounting service with UIs that are designed specifically for accounting. You can identify the flow of funds at a glance from an intuitive dashboard, which is there to aid your understanding. Management of receipts, claims/obligations, settlements, funds, and reports are provided and the information from receipts is utilized for tax accounting. We have incorporated the know-how of NAVER and LINE employees who are on the front line of global business. Korean, English, Japanese, and Chinese (simplified or traditional) are supported by default. We support the time zone feature and reflect the user's time zone on WORKFLOW documents to assist with global communication. Also, official currency exchange rates are reflected through the exchange rate API from NAVER and can be utilized for accounting duties. You can select to use workflow, human resources, and accounting systems for enterprises for a service that is combined with groupware. The public capacity of WORKPLACE is the capacity of shared documents and the public capacity of LINE WORKS is the capacity of using the messenger, Home, and drive. You can experience a 1 month trial version, free of charge.